Time moves quickly and so do I trying to keep up with my schedule. I am in another hotel room in Tuscaloosa, Alabama (Roll Tide). I had a great day at the Southern Miss game in Hattiesburg. I met some wonderful people today and can hardly wait to write about that experience tomorrow. However, I need to finish the profile I began yesterday before I fell asleep! I want to give the respect to the game I went to on Friday night at the University of Texas were I got the privilege of talking to a legendary Texas high school baseball coach. So, if you read “Dozing Off”, I’m going to reiterate some of what I already stated. If you will, pardon the repeated information. Showing me his Championship rings! John Langerhans was a coach for 29 years for three different schools. Through his career, he compiled a record of 615 wins 200 losses, winning one Texas State Championship in 1997. If you think that is the end of the story you are sadly mistaken. During John’s college years from 1969-1972, he played for the Texas Longhorns as a first baseman and pitcher (none of this specialization they have now-a-days). John would pitch on Friday and then play first base Saturday and Sunday! He was drafted out of high school by the Minnesota Twins in the second round but decided to go to college. In 1971, the Milwaukee Brewers drafted him in the third round, once again he elected to stay in college for his senior season at Texas. Finally he went on to play pro ball for the Cleveland Indian organization who drafted him in the third round in 1972. If you are confused about all the drafting, so am I. Things have changed since then! John went on to tell me he made up his mind to dedicate his life to the game of baseball at the age of 6 or 7. His Dad was a coach. John told me, “I saw the thrill in his eyes of seeing his kids be successful, in baseball and in life”. That look has stuck with him until this day. That dedication still drives him to coach, even though he retired from coaching in 2003 and as a high school history teacher. Initially he gave some lessons and “pittled” around the first couple of years but he got back to coaching select youth baseball in 2005. His schedule has been full ever since. John and his wife, Sharon, have been married for 41 years. He said, “She used to come to all the games but now just follows their son Ryan on the computer.” Ryan Langerhans was drafted in in the third round of the 1998 Major League Baseball Draft by the Atlanta Braves, currently a free agent, he was in the “Big League” for 11 years from 2002 until 2013. In addition to the Braves he has played for the Mariners, Nationals, Angels, Blue Jays and Athletics. Ryan continued the family tradition and their love of baseball. John told me that he modeled a lot of his coaching style after Hall of Fame Texas baseball coach Cliff Gustafson. “Cliff was real simple on pitchers, if you didn’t throw strikes he pulled you”, John then repeated that statement to me to make sure I understood. John seemed very humble to me, he patiently answered all my questions. I told him that I didn’t like the artificial turf that Texas had installed. He explained as a player he probably would prefer to play on artificial turf since it makes everything predictable, but agreed that it does take away something from the game. We talked about the use of the BBCOR bats, he liked them but thinks they should just use wood. He prefers small ball to long ball most of the time. The fact that you have to really think through all the situations as a coach and can’t just rely on the kids to get up there to hit a home run. “With Cliff we as players never doubted him, he was always playing the percentages. If a guy was a .220 hitter with two guys on 1st and 2nd, why wouldn’t you make him bunt, but he always let a .400 hitter swing away in the same situation”, John stated this very nonchalantly. I was sitting there pinching myself thinking am I really talking baseball with this guy, am I really qualified. I loved that I was in that situation. I was in Texas watching a game at a baseball powerhouse. Talking with a man who played for Cliff Gustafson and who’s son has been playing professionally for 17 years! I failed to mention some of the “kids” that John has coached have played professionally. Eighteen to be exact! Texas lost to TCU 2-0. John said that he has coached five or six of the kids on the two teams. I was impressed. 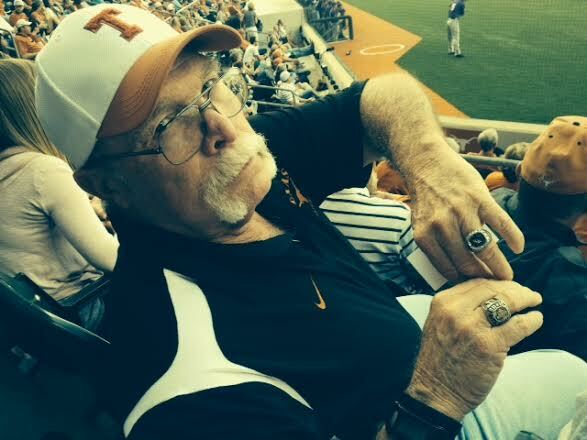 You could tell that he enjoyed that he was a part of Texas baseball history and I know I would be. I could talk about this guy for another 2000 words! If you just Google his name you will see all the stories and accolades. My time to be humble was now. I was truly grateful that he took the time to talk with me.